You’ll have to indulge me on this one. This is my favorite cheesy costume adventure-romance movie ever. Rudolf Rassendyll (Stewart Granger) is an Englishman on vacation in a little country called Strelsau. His vacation happens to coincide with the coronation of their new King, also named Rudolf (and also played by Stewart Granger). King Rudolf is a lush and a layabout, and has many enemies. The night before his coronation, the Duke of Strelsau (Robert Douglas) arranges to have the King put into a drugged sleep. The King’s most loyal leaders (Louis Calhern and Robert Coote) corner Rudolf the Englishman and coerce him into pretending to be the King until he recovers. They assure him it will take a day, maybe two, and then he’ll be able to go home without any trouble. It takes some doing, but eventually they convince him he’ll be doing the country a great service, even though it isn’t his country, it’s still a noble gesture. Rudolf goes through the coronation with ease, but there’s a hitch. The Duke’s henchman, Rupert (James Mason) sees that the coronation went through without a problem and figures out they’ve used a double. He kidnaps the real King, leaving Rudolf, in imposter, in his place. Rudolf is furious – mostly because he is done playing someone most people hate – and he wants to be let out of his obligation. However, he is convinced to stay until they can rescue the King. Agreeing to stay means appearing in public as the King, as well as pretending to be him in private with the King’s beautiful fiancé by arranged marriage, Princess Flavia (Deborah Kerr). Flavia is another person who hates the King – which is a shame, since she has to marry him. However, regular Joe Rudolf is a completely different person. While the real King’s advisors search for the kidnapped King, Flavia and Rudolf fall in love. Suddenly, staying as the King isn’t looking so bad. With forces pulling at him on all sides, will he help the patriots rescue their King so Rudolf can go back to England, or will he help the rebels so he can stay with Flavia? And how will Flavia react when/if she discovers Rudolf isn’t who she thinks he is? I love this movie mostly for the actors. Stewart Granger, Deborah Kerr and Louis Calhern are always delightful to watch. James Mason steals every scene he’s in, as per usual. I just love him. Plus, there’s pretty much everything in this movie: romance, humor, swordfighting, pretty dresses. This is one instance where I prefer the remake to the original – yes, this is a remake. The original has Ronald Coleman in the lead, who is also amazing. But I really do prefer this version, even though they used the same script, soundtrack and camera angles (no lie). I think they even modeled the costumes off the original. The thing I love most, aside form James Mason, is Flavia’s character. She gives a speech at the end that rips my heart out every time. Plus, it’s just a fun, light watching movie. Very cheesy at points, especially during the big swordfighting scene. But it’s all good fun. Great to have on while you’re folding laundry or something, and safe to watch with the kids. 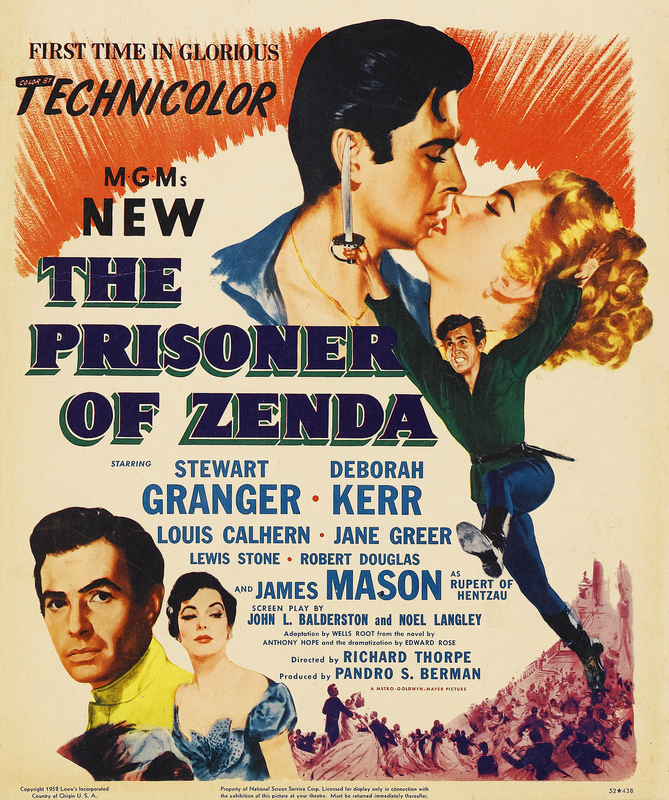 The Prisoner of Zenda will be on TCM on Saturday, October 20 at 5:15 pm CST.